Ultimately, what The Grange lacks in customisation and detail, it more than makes up for with its stunning, unique sound and the unquestionable cachet of its three stars. Extraordinary, characterful sounds. Huge collection of loops. Star drum sounds on tap. More diverse, articulate virtual drum options available. Rather have MIDI loops. 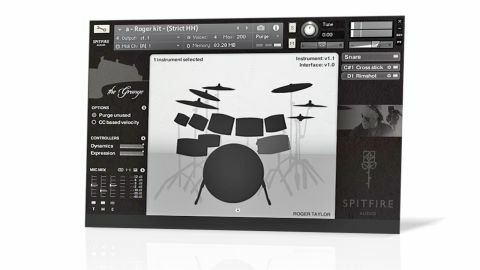 For this remarkable Kontakt 5/Player library, Spitfire Audio took three of the biggest names in drumming - Queen's Roger Taylor, Red Hot Chili Peppers' Chad Smith and UK session monster Andy Gangadeen - with their kits and drum techs, to the legendary Headley Grange, where many classic rock tracks were recorded in the 60s and 70s, most famously Led Zep's When The Levee Breaks, with its amazing drum sound. The Grange (27GB) comprises multisampled virtualisations of the three kits (plus a brushed version of Gangadeen's) and a huge collection of loops, with every hit, articulation and groove played by the drummers themselves, and the whole thing tracked to 2" tape. "Exuding quality, character and an organic vibe, The Grange is a thing of beauty"
Four sets of kit NKIs are included: Mixes, Easy Tweaks, Kit Mics and Stereos. The Mixes kits feature adjustable Tight, Mid and Epic ambient mic channels, the last of which has the mics placed two floors above the drums. Gangadeen's kit, however, swaps the Epic option for a close-in Super Tight alternative - canny, given his less rock-orientated sound. The next level of complexity comes with the Easy Tweaks kits, which enable levelling of the Tight channel, plus mics on the ground, first and second floors. The Kit Mics NKIs give control of the direct kick, snare, hi-hat and toms channels, and are intended to be mixed with the Stereos NKIs, which provide an array of room and overhead mics, the combined result being a flexible mixing setup via which everything from a touch of room to the full, Bonham-esque hall can be dialled in. Exuding quality, character and an organic vibe, The Grange is a thing of beauty. It's not perfect, though: Roger Taylor's crashes are all doubled with kick drum hits, which is a bit weird; the Kit Mics and Stereos kits would be more intuitive and practical merged into single NKIs; and we'd much rather have the loops in MIDI than audio. It also has to be said that there are far more diverse, editable and articulation-rich virtual drum kits out there with smaller price tags.